AN OBJECT ball hanging inches from a pocket is a good thing. You�re nearly guaranteed of making the shot and staying at the table. But it�s still amazing the number of times players, from beginners to world champions, misplay position. Now, for the beginner, it�s more often than not due to inexperience or ignorance of the dangers. For the top-level players, though, mistakes occur when there�s a lapse in concentration. As always, every stroke has to be treated with the same mental effort; your pre-stroke routine has to be sound so that you take time to deal with each part of a shot. Instead of cutting corners with a hanger � say, not chalking your cue or cutting your practice strokes from five to one � you need to run through your normal process, from addressing the ball through delivering a smooth, steady stroke. But back to errors borne of inexperience. When the object ball is a foot or two from the pocket, you�ve got a very narrow window where you can contact the ball and send it into the pocket. But with a hanger, you can hit the object ball in a number of places, sometimes anywhere from entirely full to just clipping an outer edge. Depending on where you need to send the cue ball, choose an exact spot where you want to cue ball to make contact. 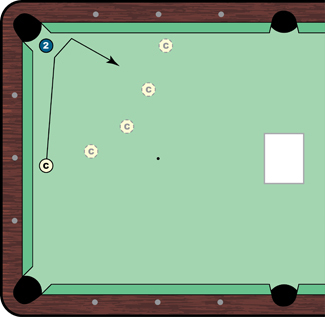 This will help you plan for the cue ball�s path to proper position. Take a look at the diagram. The goal is to sink the 2 ball and have the cue ball stop on the piece of paper in the center of the table. Start with the cue ball against the short rail. You have a natural path off the object ball, off the long rail and straight toward the center of the table. When you can successfully play position five times in a row, move the cue ball to the long rail and repeat the process. When you�re getting comfortable with this scenario, put the cue ball in different spots and see how it�s path after contact is dependent on how much of the object ball is hit. In this case, as with many situations, a little experience can go a long way.